The beginning of August has been a blur. We've already had orientation for a new year of the internship (our sixth class! ), gone away for a staff retreat, and put on a 2-day prep for the UTD/Richland/TWU Dallas student leaders. After just the few times I've been with our new UTD staff, I'm already so impressed by them. They are talented and eager and passionate for the Lord. We have five great interns who will be leading small groups and mentoring student leaders this year. And as I've mentioned before, our leader team will also be driving outreach at Richland and TWU Dallas, two smaller campuses. This will allow their student leaders to be a part of a bigger leader team. They'll also be coming to our Friday Night large group meetings. Our overall staff this year is huge! But that's fitting considering the 9 (maybe 10) campuses we will be reaching out on this year. It's crazy to me to think that we have nearly 30 campus pastors now. I remember so many years early on when I was excited to see 30 people at one of our events! But God is faithful. He put a mission and a vision on my heart–one that I know many of you share–to plant vibrant, outreaching, Jesus-loving communities on every campus in the DFW area, communities who would make and mature disciples to His glory. Sending six amazing ministers to Arlington this fall to begin building at UTA is a huge step forward in that vision. Would you set a reminder to pray for that mission work daily over the next month as it begins? Pray for God to guard the hearts and minds of our amazing team of students and pastors who have moved away from all their friends to build the kingdom elsewhere. Pray that they would be bold to share and live the message of God's love, that the Spirit would work in the hearts of those they encounter, and that the devil's plans there would be frustrated. I've watched your intercession to our good God make a difference repeatedly in the past, and I know it will again! Lastly, at UTD this year, we have a great student leadership team. 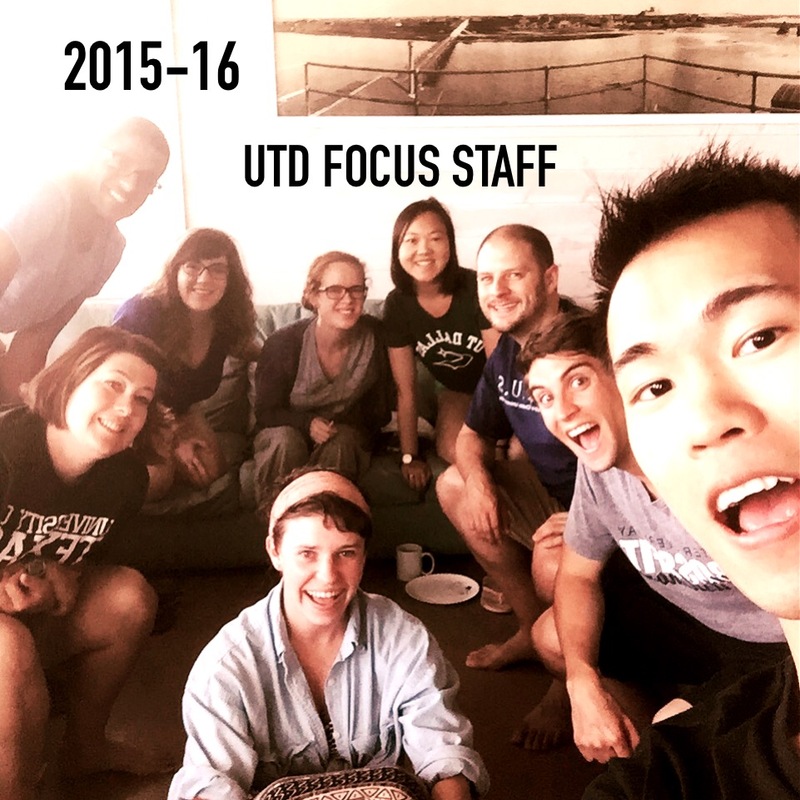 We have 38 UTD student small group leaders, 2 at Richland and 2 at TWU Dallas. And we have a lot of other leaders who serve in various other ways. With the Spirit's help, they will make a huge difference this year. After our prep weekend with them, I'm so excited to see what they do! Thank you for your prayers and thank you to those of you who partner financially with us. FOCUS is not a rich ministry, but I feel like the widow visited by Elijah in 1 Kings 17–the jar is never full but never goes empty. I think it's through depending on you and so many like you that the Lord teaches this community to depend on Him.